Everyone knows that durians smell...potent. For many people, that may be all they know about the Asian fruit. (Fun additional fact: The internet seems to claim that durian can also ward off bed bugs!) But what’s behind the smell often compared gym socks? A team of scientists – hopefully armed with a bag of clothes pins for their noses – recently found out. 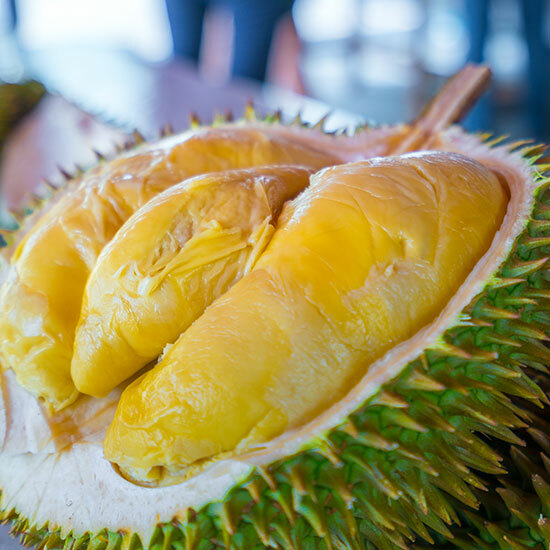 But possibly the most remarkable finding was that, despite all these crazy smelling compounds that contribute to the durian’s distinctive and complex scent, eventually researchers discovered that it only took two of these chemicals to effectively recreate the fruit’s entire odor: the fruity ethyl (2S)-2-methylbutanoate and the oniony 1-(ethylsulfanyl)ethanethiol. Put those two together and you get a lovefest reminiscent of being forced to go on a long drive with your ex-wife. As for the ramifications of this study, well, that’s in the nose of the beholder. I guess flavor designers could now concoct some wonderful durian soda or gum. Or, more likely, this information could prove to be a revolutionary step forward for the stink bomb industry.